Eight years ago Hayesville, North Carolina resident Bob LeKites decided that autumn in Clay County was missing something. A festival, a big festival, something fun for the entire family, something different. Having come to the mountains of Western North Carolina from Delaware, Bob had an idea, something that he had been a part of up north. Punkin Chunkin. The first year Bob organized the event with the help of many others. He made a Punkin' Chunkin' machine which is like a 20 ft. tall slingshot! After the first year, Bob turned the event over to the Clay County Chamber of Commerce who saw it as an opportunity for the community to come together and celebrate fall! Bob remained a huge supporter and advisor for the event. Punkin' Chunkin' is a sanctioned event with an official rule book. It is undeniably a ton of fun! Groups, businesses and individuals build the machines that must meet certain safety specs and each team gets a chance to chunk some punkins and the one that “chunks” the farthest is the champion. There are different levels in the competition, for instance the Collegiate level welcomed 20+ colleges who worked through their engineering programs to designed machines to compete. A lot of thought and work goes into the manufacturing of the catapult-like instruments. There is more to this festival than throwing pumpkins around, there is great food to eat, magicians, performers, demonstrations, other competitions and races. Those attending the festival can also look forward to a Cherokee Indian Exhibit. One new addition this year is air-plane rides where guests can ride ten minutes over the gorgeous mountains of WNC. You can even “fly in” if you'd like. Running a Punkin' Chunkin' machine is no easy task, it takes 3 – 6 people to man the machine. 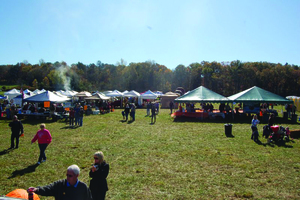 In recent years the festival made a move to the property of generous Hayesville resident Vic Payne. His 42 acre ranch is the perfect setting for the event and provides ample space to “throw down” and have a great time. 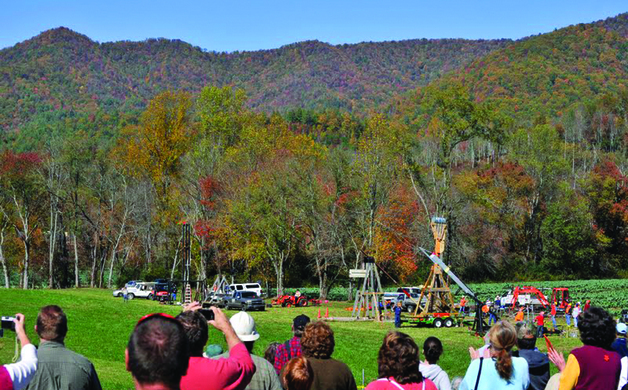 The location for the Punkin' Chunkin' event is 811 Settawig Road in Brasstown and folks will be gathered on October 15th from 10 AM – 6 PM and they'll gather again on the 16th from 12 PM – 6 PM. For a schedule of events a visit to www.ncchamber.com is in order. Show promoters expect record crowds this year as the festival continues to grow. 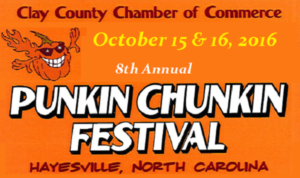 For a preview of the event you can look for Punkin' Chunkin' in Hayesville on Youtube or visit the Clay County NC Chamber's Facebook page. Additional information is available by calling the Clay County Chamber of Commerce at 828.389.3704. Content courtesy of the Clay County Chamber of Commerce.